Carver in 1984. He didn't see himself as a minimalist. The standard advice for young writers has always been "Write what you know." 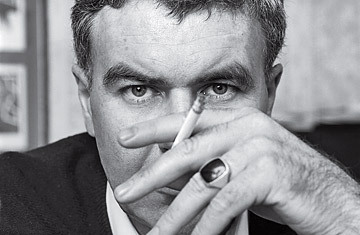 Raymond Carver did exactly that. It so happens that for most of his life, what Carver knew best was hardship, both physical and psychological. In his short stories--tight-lipped parables of abjection that became hugely influential in the 1980s--life is a kind of nonstop distress sale. The apartments are shabby; the rent is unpaid; the living room furniture has been carried outside and strewn across the lawn. The people seem dislocated too, even when they're stuck in one place, licking their wounds and drinking hard.